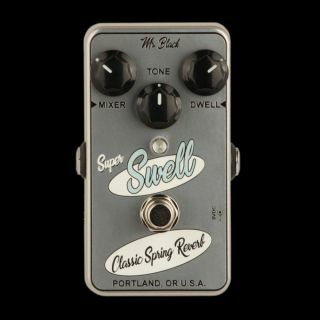 Mr. Black has released the Super Swell, a new pedal designed to recreate a vintage tube-driven outboard spring reverb tank for “extra-drippy, super-washy” sounds. The Super Swell features three controls, just as you would find on an outboard reverb tank: Dwell, which sets how much signal is sent into the spring controls; Mixer, which spans from completely dry to completely wet and Tone; which helps dampen the high end content or add extra. Additionally, there’s true bypass switching and a choice of 9V battery or power supply operation. The Super Swell is available for $179.95. For more information, head over to MrBlackPedals.com.